10 Best Kids Ride-On Toys Below $300. Gift Ideas for Children. The holiday season is here! Can you believe it? If you have little children, you know this means only one thing… toys! One of the best toys you can get your children (and one of the toys they will love the most!) are ride-on toys. These “miniature vehicles” give your children the fun and the freedom of driving around the yard and the house at their own speed and at the safety of your precaution. Ride-on toys make fantastic gifts for all children. With many different options available on the market, some of which are a little expensive, we decided to take a look at some of the 10 best kids ride-on toys below $300. Check out our list below and see what ride-on toys will be best for your family and your children this holiday season! The Peg Perego Polaris Outlaw – Red is a hot rod ATV-style ride-on toy perfect for the little adventure seeker. This toy is made in the United States and has two-speed controls: One at 2.5 mph and one at 5 mph. A reverse gear is standard as well along with second gear lockout controls. This toy features all-terrain wheels so your child will have the time of their life taking their adventure on any ground no matter if it is grass, dirt, gravel, and pavement. 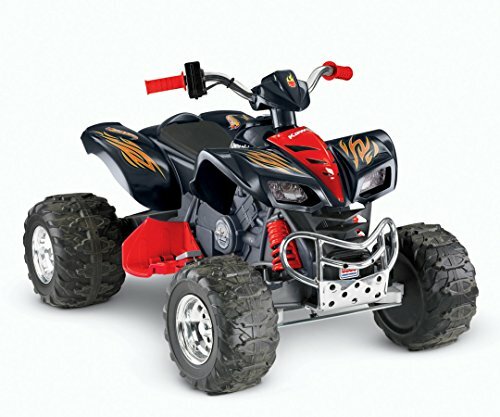 High-performance motors operated by 12-volt rechargeable batteries with an included charger keep this toy running smoothly. An accelerator pedal with automatic brakes is included standardly as well. 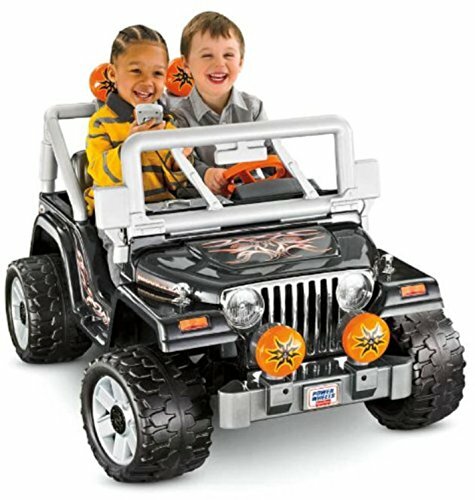 Your child will be traversing the lands in the Fisher-Price Power Wheels Tough Talking Jeep Wrangler! This ride-on toy resembles the Jeep Wranglers found on the roads today, so your child will have so much fun in this vehicle. This ride-on toy includes a Tough Talking microphone with a working speaker to deliver fun sounds and rocking tunes during your child’s ride. The vehicle is able to drive on both hard surfaces and grass to keep the adventures going no matter where they are. The Jeep Wrangler replica is able to go at speeds of 2.5 mph and up to 5 mph in the forward direction and can go up to 2.5 mph in reverse. A 12-volt battery and charger are standard included too! Does your child love agriculture? If so, they will love the Peg Perego Case IH Magnum Tractor/Trailer! This ride-on toy looks just like the farm machinery they will see in real life. 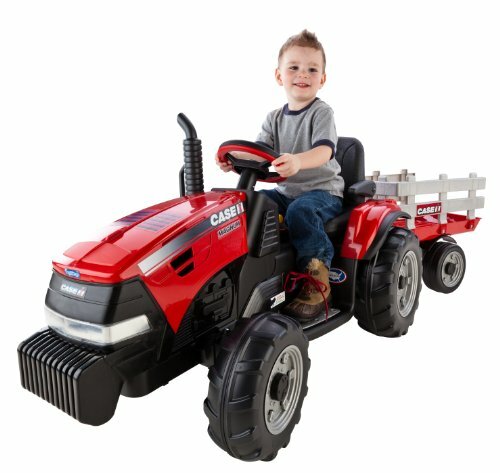 Your child will have the time of their life with the extra large stake-side trailer included with the tractor to help them carry their loads as they are playing. Extra traction is provided on the tires so your child can work through all terrains. Included on the ride-on toy is an accelerator pedal with automatic brakes. A two-year warranty with customer participation is included as well. 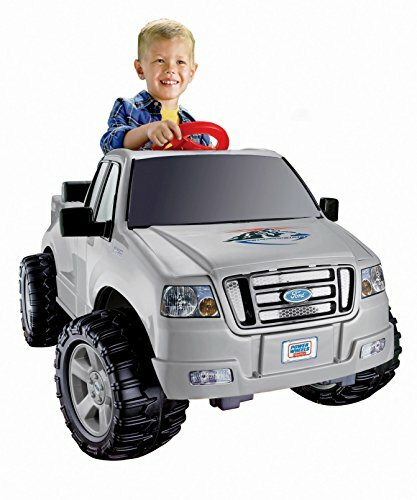 Your child can have their very own truck with the Fisher-Price Power Wheels Ford F150! This ride-on toy comes in either gray or yellow and has a pretend engine for extra fun when playing. Big tires that are rugged with strong grip allow your child to take their journeys beyond the road and into any terrain they desire. The Fisher-Price Power Wheels Ford F150 is able to travel at 3.5 mph max in both forward and backward directions. It includes a roomy truck bed so your children can take their possessions with them wherever they go. A 6-volt battery and charger is included as well. Drives on hard surfaces, wet grass and rough terrain. Refer instruction manual before use. 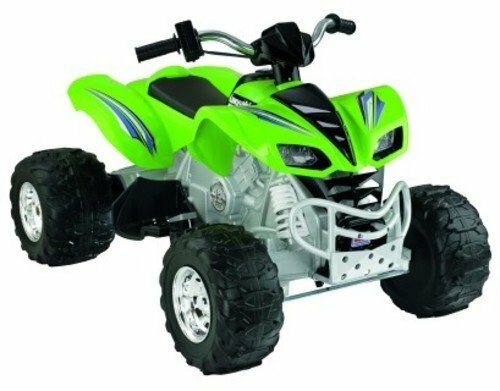 The Power Wheels Hot Wheels Kawasaki KFX is perfect for the child who loves Power Rangers! This ride-on toy is decked out in Power Rangers gear and the realistic ATV styling of the toy allows your children to experience the fun and excitement that ATVs have to offer. Your children can have the time of their life in their own backyard! With this ride-on toy, a twist grip throttle revs the toy into high speed which there are two-speed settings of, one at 2.5 mph and the other at a max speed of 5 mph. The vehicle is able to go in reverse as well. A 12-volt battery and charger are included too. 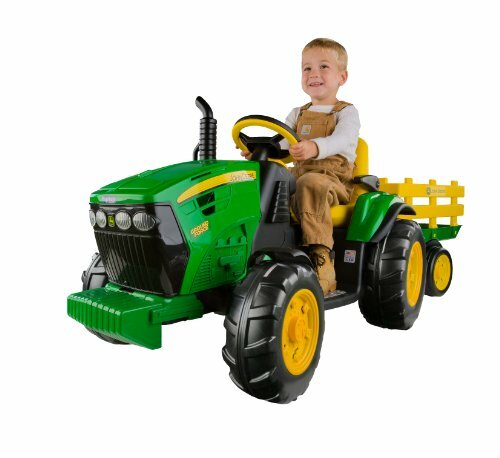 If your child is an aspiring farmer, they will love the Peg Perego John Deere Ground Force Tractor with Trailer! This ride-on toy looks exactly like the big green rigs your children will see on the farms nearby. The Peg Perego John Deere Ground Force Tractor with Trailer has farm tractor wheels that provide strong traction on grass, dirt, gravel, and pavement. An extra large stake-side trailer is included for your child’s farming adventures. A working FM radio allows your child to listen to their favorite tunes as they help with the family chores! Plus, an adjustable seat with flip-up armrests and an accelerator pedal with automatic brakes are standard. Are you looking for the most fun ride-on toy for your child? Then, this is the perfect option for you and your family! 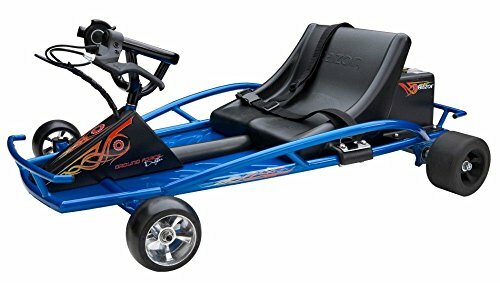 The Razor Ground Force Electric Go-Kart is sure to give your children the time of their lives! This ride-on toy is designed for children ages 8 and older. The electric go-kart has a quiet variable speed with a chain-driven motor that allows it to reach speeds of up to 12 mph. It is able to operate with 45 minutes of drive time per charge and has a durable steel frame, molded aluminum wheels, and 4.5-inch tires. Get ready for an adventure with this ride-on toy! The Razor Dune Buggy is for the children who love to seek thrills! The compact kid’s dune buggy has a powerful 350-watt electric motor to help it reach speeds of up to 10 mph with 8-inch pneumatic tires. 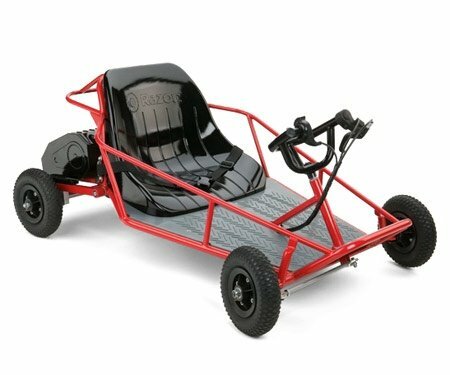 This dune buggy features hand throttle and brake controls and has a durable tubular steel frame to support up to 120 pounds of driver weight for those who are 8 years old and older. A padded bucket seat with seatbelt secures the safety of your children. 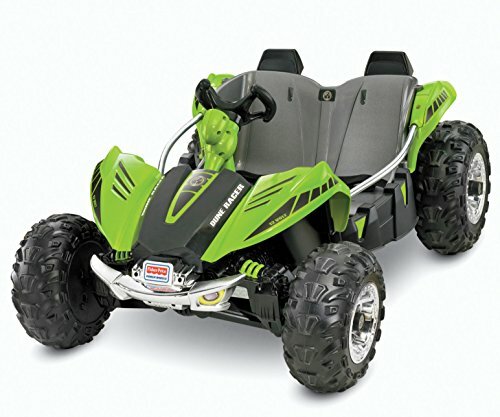 The Fisher-Price Power Wheels Green Kawasaki KFX is the ideal ride-on toy for the child who loves the idea of ATVs! 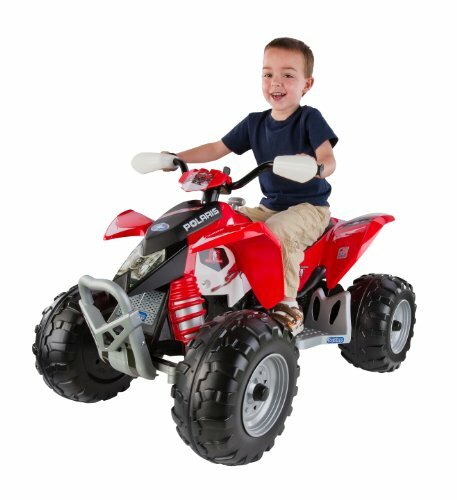 This toy looks exactly like the ATVs they often see and gives children the opportunity to experience the fun of all-terrain vehicles in their own backyard. This toy operates on ruts, wet grass, mud, gravel, and rough terrains so there is no match for what this ride-on toy ATV can handle! It won’t get stuck thanks to the tough tires and the 12 volts of battery power that launch it to two speeds of 3 and 6 mph. A charger is included standard with the battery. Your children will have the time of their lives with the Fisher-Price Power Wheels Green Dune Racer! This awesome ride-on toy features a monster traction system that allows it to drive on rough terrain, wet grass, and hard surfaces along with any other surface your children are ready to conquer. This vehicle drives in both 2.5 mph and 5 mph going forward and can operate at 2.5 mph in the reverse direction. It includes metal sidebars for hand support and a power lock brake system for increased safety. A 12-volt battery and battery charger are included as well. This holiday season, your children will have the time of their lives with ride-on toys! With ride-on toys available in all types, including those relating to farm tractors to dune buggies and ATVs, you will find the best gift options for your children. Bring them the greatest happiness with their new ride-on toy! You may be also interested in 10 Bets Ride-On Toys below $150 (for smaller kids). Or if you can spend a bit more for a present, take a look at Razor ATV.